Just for fun the other day I went on a search for fun Halloween Apps for Kids for my iPhone. I was amazed at how many turned up and downloaded a bunch, almost all of them free. The kids and I checked them out, here are our favorites ..
Disney Mickey’s Spooky Night – A animated story with words (that are read to you) with puzzles to complete along the way. My 4 year old loves this one. This was one of the one’s that I paid for … it was $0.99. Halloween Kids Puzzles – My 4 year old is really into puzzles right now, so this is great for her. The free version comes with 4 Halloween-themed puzzles for kids to put together. Parents can change the settings to adjust the difficulty. StoryBots Halloween – This is BY FAR is our favorite. We all got a big kick out of this silly app … and have been watching the video we creating over and over … and over and over and over. Here’s a link to our funny little family as kooky monsters! Halloween Color Mix – The free version comes with 2 Halloween “coloring” pages to “touch to fill” or freehand “color”. There are also Halloween background pages for free drawing. Kids can choose and mix their own colors. Halloween Puzzles and Color – The free version comes with 4 Halloween characters that you can put together as a puzzle and/or color in. Halloween Games PicknColor – 8 free “coloring” pages for kids to fill in. I think this one has some of the better images compared to other apps. Pumpkin Creation – Create a jack-o-lantern without all the (awesome) sensory mess! Players can select the color pumpkin, plus each facial feature and add-ons to make pumpkin masterpieces! Halloween Concentration – A Halloween themed memory game. As you succeed each game the level of difficulty increases. My four year old enjoys this one. Spookley the Square Pumpkin – This app is the storybook of Spookley. You can choose to have the app read the story to you … or you can read it yourself. Super cute story about being different! 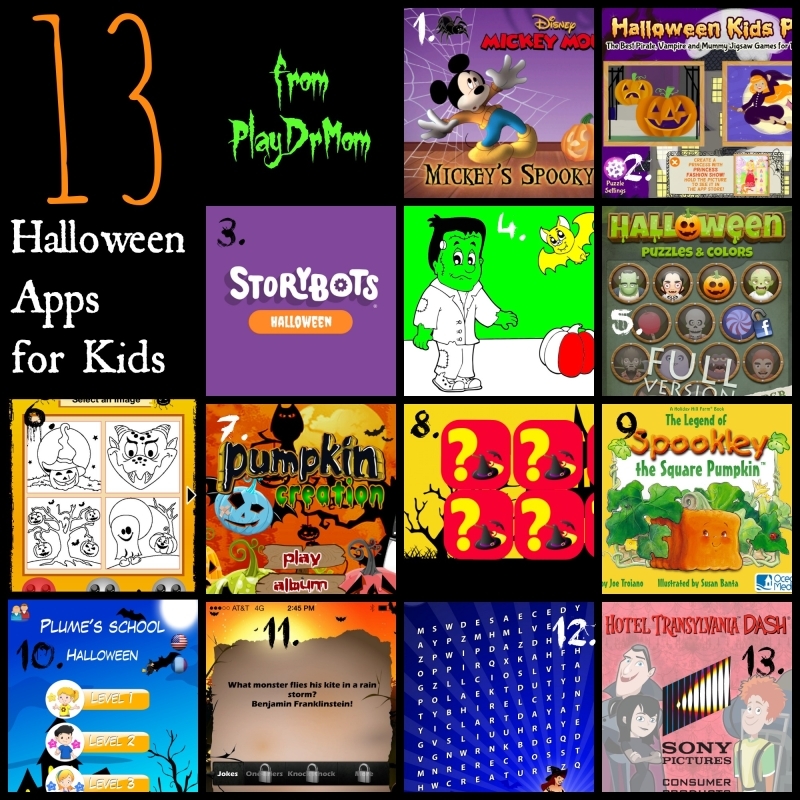 Plum’s School Halloween – This is a more educational app, with a Halloween theme. There are 3 different difficulty levels – but geared towards preschool, kindergarten and 1st grade. Halloween WordSearch – I got this one for my 7 year old son who is really getting into word searches. In these ones, you need to find Halloween related words. Hotel Transylvania Dash – A fun, pretty simple game for kids that can read … players help the characters take care of the hotel guests. My son and I really enjoying playing it! Spooky Halloween Match 3 – I’m kinda addicted to games like Bejeweled, Candy Crush, and Jewel Mania. This one is like those … but uses a Halloween theme. What a great list! I forgot about checking my iPad for Halloween apps for the kids. I should look for Christmas ones soon, too.